One of the strangest features in Final Fantasy XII: The Zodiac Age, which comes out today, is called the gambit system. This system allows you to write out a sequence of if-then statements, like “if you see an enemy, then attack it” or “if your HP goes below 100%, then use a Potion.” You can assign these gambits to your entire party, scripting them to automatically fight, cast spells, and heal one another at optimal times. In other words, you can teach the game to play itself. What to make of a system like this? Is Final Fantasy XII trying to train us all to become programmers? Are the developers trying to automate the menial parts of traditional role-playing game combat? Are the creators suggesting that RPG combat requires so little thought, you can create AIs to handle it for you? Final Fantasy XII: The Zodiac Age is a remastered version of the original 2006 PS2 game, and it takes things further by adding a fast-forward button. The game still mostly involves you controlling a party of three characters as you roam fantasy terrain and fight monsters. It’s a third-person game, much like all other FFs, but you can see every enemy on screen before fighting it. That was a more radical departure from series standards in 2006 than it may seem now. With the fast-forward button, you can double or even quadruple the game’s speed while you’re exploring and fighting. Fast forwarding makes Final Fantasy XII significantly better, but something also feels off about it, as if the developers are apologizing for making such a slow, tedious game. Are they trying to make up for the sluggish pace of a JRPG by letting you speed through it all? I’ve spent nearly 40 hours with Final Fantasy XII: The Zodiac Age over the past two weeks, and I keep thinking about all these questions. Why, I keep asking myself, am I having so much fun playing a game in which most battles play out while I merely watch? Why do I have the urge to complete all 45 hunts and finish all the sidequests, something I almost never do in video games? Why has my opinion on Final Fantasy XII evolved from “this is just fine” in 2006 to “this is phenomenal” in 2017? I’ve come up with a bunch of possible answers. Here are, oh, eight of them. 1. The world is charming. Final Fantasy XII is set in Ivalice, a world full of Game of Thronesy political conflict, high fantasy, and the never-ending backstabbing you might expect from the minds that brought us Final Fantasy Tactics. 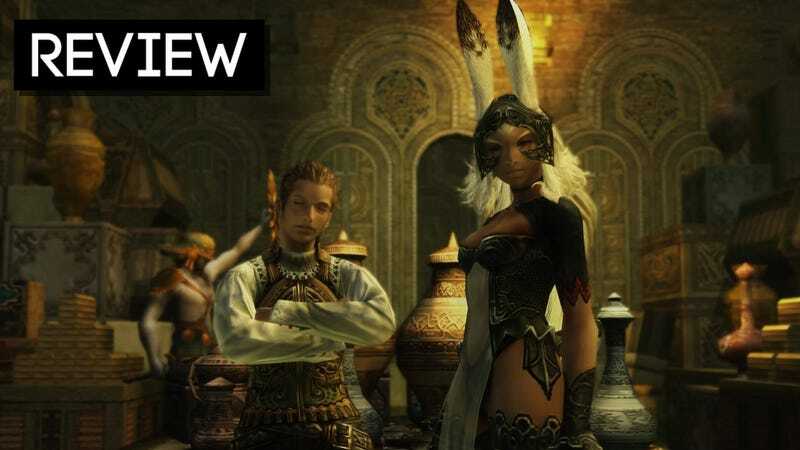 The game’s story revolves around a war between an evil empire called Archades and a resistance group led by the princess of Dalmasca, Ashe, and Final Fantasy XII does a good job of keeping things interesting even as it deluges you with proper nouns. Over the years, many critics have compared the game’s story to Star Wars, which is fair, because the game’s story is basically Star Wars. You’ve got a central conflict between a nasty imperial force and scrappy rebels. You’ve got a suave mercenary who claims to only be helping the heroes because he’s after money. There are no accidental brother-sister kisses, but there is a masked villain with a surprising familial connection to one of the protagonists. Final Fantasy XII’s story loses steam toward the end, but the characters—namely, the princess Ashe, the tortured knight Basch, the sky pirate Balthier, and the rebellious bunny-lady Fran—stay interesting throughout. The other protagonists are Vaan and Penelo, two clingers-on who have no real purpose and spend most of the game goofing around while the rest of the party is doing interesting things. But hey, the six of them make for an entertaining crew, and it’s fun to watch them explore Ivalice’s massive deserts, frozen mountains, and hidden caverns. Here’s the fun thing about the gambit system: You can use it to make your characters do just about anything. As you progress further in the game and teach your characters more skills, your gambit options will open up, allowing you to play with the system in creative ways. For example, you can script your party to drench an enemy in Oil, a status effect that makes characters weaker to fire, and then cast Firaga to set that enemy ablaze. Or you can teach your characters to use Poach to convert weakened enemies into useful items. Or you can combine Berserk, Haste, and Bubble to turn one of your party members into a mindless killing machine. The combinations go on and on. There are two different types of grinding in role-playing games. Let’s call them the good kind and the bad kind. “Good” grinding is monotonous but satisfying, like chopping trees or lifting weights. “Bad” grinding is tedious and feels like busy-work designed to slow your arrival to the game’s end. Grinding, of course, is the act of repeatedly killing enemies for experience, loot, and gold. It’s often criticized for all of the reasons you might expect—doing the same thing over and over again isn’t very fun. It is not a worthwhile use of time to face a difficulty spike in, say, Dragon Quest VII and then feel forced to exit a dungeon and run around in circles, mashing buttons to make your party attack the same enemies over and over again until you’re strong enough to beat the boss. There’s something different about Final Fantasy XII. Grinding in this game is like entering a meditative trance. Because so much of the combat is automated, you’ll likely find yourself enjoying the process of walking into a new zone, smashing into enemies, and watching your characters do all of the work without pressing a button. The economy is set up to leave you always wanting more money so you can afford that shiny new weapon or powerful new spell.Grinding in Final Fantasy XII doesn’t feel punishing—it feels soothing. And that soundtrack never gets old. 4. The production values are tremendous. As with many JRPGs, Final Fantasy XII is elevated by its soundtrack. Composed by Hitoshi Sakimoto and re-recorded for the PS4 remaster, the tunes of FFXII are more sweeping and orchestral than Nobuo Uematsu’s melody-heavy soundtracks in previous Final Fantasy games. Even when you hit the fast-forward button, you hear the incredible music at normal speed. Highlights include tracks in Rabanastre and the Giza Plains. This is a game with great grand spectacle as well as terrific tiny flourishes, like the sound of a sword clash or the appealing blue lines that connect your party members to whomever they’re attacking. The writing is stellar, thanks to some very good localization work by editor Alexander O. Smith and team, whose script takes itself seriously but never too seriously. The vocal performances are also top-notch, aside from Vaan, who’s sort of like an anime Aladdin. Sadly, there’s no way to mute him and only him. The quality of writing in Final Fantasy XII makes it stand out from other Final Fantasys. It’s up there with the likes of the excellent Trails in the Sky for sharp, well-crafted dialogue. This is a game where it’s worth taking the time to talk to every NPC. In Final Fantasy XII, your characters grow more powerful by acquiring License Points (LP) from defeated enemies and then using those LP to unlock nodes on what’s called a License Board. Whereas in the PS2 version this board was a mess, in Final Fantasy XII: The Zodiac Age it’s been neatly carved up into jobs. Each character can pick two jobs, giving him or her access to those jobs’ boards. Make Balthier a Machinist and White Mage, for example, and he’ll be perfectly suited for blasting enemy dragons in between Curaga runs, although he won’t be able to equip the Heavy Armor you’d get from a Knight or Foebreaker board. You’re always making interesting decisions: Which jobs should I use? Which nodes should I unlock? What should my party balance be? This helps justify Final Fantasy XII’s automation of the less interesting decisions in JRPGs, like who your characters should target and when they should heal. Both the mandatory and optional bosses of Final Fantasy XII come with all sorts of wrinkles that force you to reevaluate your gambit strategies. Try to take on the Trickster or King Bomb with your standard gambits and Final Fantasy XII will laugh at you. “Lol,” the game will say. “You still think you can make me play myself?” These bosses will trip you up with status effects, cast shields to make themselves immune to your attacks, and run around the battlefield to heal and take cover. Beating them takes a lot of thought. This time around, I’ve happily discovered that hunts—optional sidequests that involve tracking down and defeating tough monsters—are the best part of the game. There are around 45 of these increasingly difficult beasts. As of this writing, I’ve got 23 down. 8. It all just clicks. Midway through the development of Final Fantasy XII, director Yasumi Matsuno suddenly departed. On another game (like, say, Final Fantasy XV) this might have led to a reboot or a jarring shift in tone, but new director Hiroyuki Ito picked up where Matsuno left off, and the game feels sufficiently Matsuno-esque. If you’ve played Final Fantasy Tactics or Vagrant Story you know what you’re getting: a certain vibe, heavy on the politics, that delves into high fantasy but always feels grounded. Although things fizzle a bit in the final act, as the story moves into the realm of crystals and gods and other JRPG nonsense, the game never stops feeling consistent. Even the random NPCs never stop getting old. This second time around, Final Fantasy XII has surprised me. I can credit some of my improved regard for the game to this remastered version’s visual polish and convenient fast-forward button. I credit more of it to the game’s innate quality. It holds up. It works well. It functions like no Final Fantasy before it or since. And it is interesting in its world and its characters. That’s why, while blazing through the deserts of Dalmasca with my party set up to automatically annihilate any enemy in sight, I’m still having such a good time.